And yes, we’re giving away PRIZES! Merry Christmas! We’ll be giving away a stamp or set on each of our designers’ blogs. All you have to do to enter is leave a sweet comment on each of the designers' Winter Wonderland Blog Hop post! Have all your comments in by midnight on Friday December 19, 2014 to be eligible. The winners will be announced on Quietfire Creations on the weekend. Happy hopping and Merry Good Luck! PS: All Quietfire rubber stamps are on sale 25% off the regular price during this event! You can see all the details and descriptions by clicking on any card image. There is also a template for the box. beautiful!!! great project. love the detail! Amazing design! Loved everything about it! What a fantastic idea!! The ornament is so pretty. BEAUTIFUL ornament & gift box Yogi - it really is a lovely gift!!! 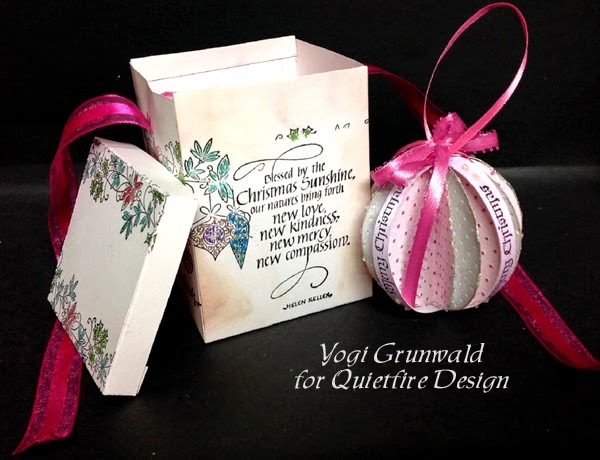 LOVE the sentiment on your box and the textures of your ornament!!! This is beautiful! I love it all. Wow.,.so pretty! I love the box! Wish I was your friend ;) This is a wonderful gift idea and, as I've just made some photo-ornaments of my grand-daughter, I may just have to borrow your box idea and make them into proper gifts! Thanks for sharing. Eeee! This is fantabulous! So gorgeous I'm speechless! Would love to have this beauty under my tree on Christmas morning. cool Christmas ball and I love the presentation. just beautiful. What an amazing idea! The box is perfect as a gift wrap or to hide little treasures. I love the ornament too - perfect as a Christmas tree decoration! It looks so elegant. Beautiful project and what a great idea to use as a gift in this hectic time of the year! Brilliant. My goodness - how beautiful!!! Wow, Yogi! You outdid yourself with the fun ornament and the exquisite box. As always, such great attention to detail. Beautiful! Beautiful. Great idea for a gift. Love the box. The ornaments circling the bottom are so pretty. The big bow is great. What an amazing gift box for that beautiful ornament!! Just an outstanding project! Love it! This is gorgeous! 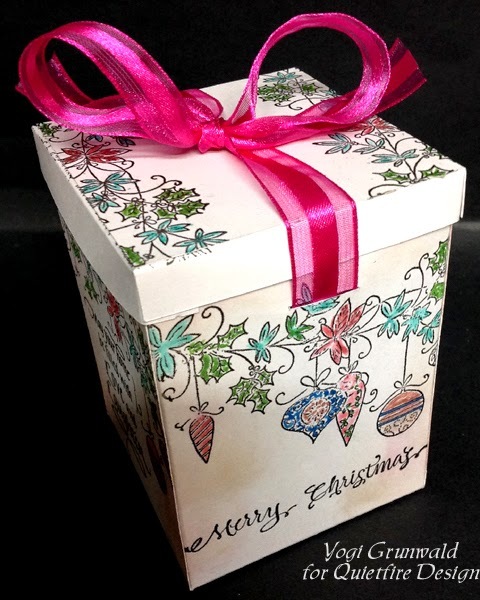 Who wouldn't love to receive this beautiful ornament wrapped in such a pretty box! Gorgeous box Yogi! It's a keepsake all by itself! Love it! Beautiful Gift idea! The box and the ornament are lovely and I am sure will be appreciated!!! GREAT job! I plan to use this for a gift card and put in some little candies. I can't decide whether I like the box or the card best. Both are great. Wow Yogi, you sure know how to impress! I love the ornament, and thanks for the pattern for the box too :) Very pretty and unique. Great idea. Love the present and the presentation. Wow this is adorable love the ornament . What a great hostess gift this would make . Beautiful ornament and box, Yogi, you never cease to impress me! What a lot of work went into it! Anyone who receives such a gift...awesome, so gorgeous. What a great idea Yogi! Beautiful ornament and gift box!! Very pretty and artistic, I love your colors and they compliment the Quietfire Stamps so well, tfs. Beautiful ornament and box! I love the way you used the sentiment for strips on the ornament! Very pretty! Thankyou for the tutorial template instructions! This is beautiful with gorgeous sentiment!I wish it was for me.The person who receives this is special and blessed! Yogi - again - the most beautiful thing ever...that box is inspiring. Very festive ornament and box! I had to stop and pull my tongue out of my throat when I saw this amazing duo of beauty! LOVELOVELOVE the ornament and the box is scrumptious! What a beautiful Hostess gift this would make or even a place setting on the holiday table!! LOVELOVELOVE everything about these!! TFS! I knew it would be something special. What a stunningly gorgeous ornament and gift box!!! What a way to wind up this hop. Wow. Just so beautiful and creative!!! Beautiful and such a perfect gift for the holiday season. You amaze me with your ability to think outside the box.... and I love it. You are so inspiring! Great idea. I have made this ornament before but just with old cards. I love the box. Fabulous box and ornament. Very creative project. What a wonderful ornament and gift box! Both of them are keepsakes and the stamping is gorgeous! This would make a beautiful gift to receive on christmas morning or as a hostess gift of thanks. Thank you Yogi for the template for this project. Beautiful ornament and box!! What a nice gift for someone, and an heirloom as well. Thx for sharing your creativity. Your project is wonderful Yogi, I think I'd be hanging that sweet box in the tree too! Merry Christmas! What a nice gift idea. Thanks for playing along with us at Little Red Wagon. What a great project! The ornament is so clever and its presentation box is beautiful Merry Christmas! Wow! how creative and wonderful! Thanks for posting this for us. I love the ornament, I made a whole bunch of different sizes, and put them on a string. love them. Wow. Your ornament and box are absolutely gorgeous. This looks like a huge undertaking!! But it sure is beautiful. What a meaningful gift this is. This is a gorgeous box Yogi :) Merry Christmas! Wow, this is so pretty! Merry Christmas! What a pretty ornament! I would love to receive a gift as beautiful as this! The box itself is its own gift already. Love it! What a great way to take a break from making cards. Thanks for the template for the gift box. What a charming idea to create such a lovely box for your ornament! How gorgeous! You wouldn't need to put a present in it, it's a gift in itself! Fab idea! TFS! You've been busy! Love your box and ornament! Wow, so much inspiration, missed yesterday, glad I came today, this project is seriously gorgeous. That project is simply beautiful! Lucky recipient! Thanks for joining our challenge at Squigglefly, and HAPPY HOLIDAYS TO YOU! This is amazing! Such a lovely gift! Thanks for playing in Squigglefly's challenge! Absolutely gorgeous...Thanks for playing along with us at Divas by Design.